I’m writing these words in the wee hours of Tuesday, September 11th, 2012. The same date eleven years ago was also a Tuesday, and the two days look to be similar in other respects. According to the weather forecast, today will be bright and sunny, with low humidity and a high in the mid-70s. New York City will be a couple of degrees cooler. So the day appears to be a carbon copy of September 11, 2001. Except, of course, that the people who live west of the Hudson River won’t see the twin towers of the World Trade Center silhouetted against the sunrise when they wake up a few hours from now. After eleven years I still remember exactly what I was doing that morning, and how the day unfolded. I expect most Americans who were ten or older at the time can say the same — just as we geezers have held on to our memories of November 22 1963 with such clarity for almost five decades. That makes two such grim days within my own lifetime. How many more will there be before I shuffle off to that great keyboard in the sky? My uncle will turn ninety in a few weeks. Over the course of his adult life he’s seen Pearl Harbor, D-Day, V-E Day, V-J Day, the Kennedy assassination, the moon landing, and 9-11. That’s an awful lot of portent to pack into a single lifetime. Almost half of those memorable days were happy occasions. Me, I’ve got the moon landing — and that may be the best I get, given current trends in public affairs. A lot of things have changed in the past eleven years. My hair is nearly white now, and my joints complain a bit when I get out of bed in the morning. My presbyopia is so bad that I need this big old monitor to see what I’m doing. My “hippie ears” have gotten worse, so that I tend to say “Pardon me?” more than I did back in 2001. My kid has gone to college, graduated from college, gone to grad school, finished grad school, and is now out on his own. All in just eleven years! But what has really changed in the last decade-plus-one is my knowledge of Islam. I didn’t know a whole lot about the PBUH prophet back then. My readings in history had taught me that Islam was spread by the sword, and my reading of V.S. Naipaul’s Among the Believers had taught me that Islamic scripture demanded the killing of infidels. But other than that I hadn’t paid much attention to it. When I was working in Northern Virginia, I saw the halal grocery stores in Annandale and Falls Church, but I didn’t attach any special significance to them. Now I know far more than I want to know about Islam. I know about taqiyya, and dhimmis, and the jizya, and Koran 4:34. I know about Aisha and Lepanto and the Sword Sura and the heaps of skulls in Macedonia and the Punjab. I wish I didn’t know these things. I didn’t set out to acquire such knowledge. I just started reading blog posts and then writing them, and exchanging emails with people who knew more than I did. One thing led to another, and now here I am in 2012, burdened down with hideous, vile, loathsome facts about what has been happening for the last 1400 years. Facts whose truth cannot be denied. Facts I would rather forget. These past eleven years comprise less than one percent of those fourteen centuries. We’ve come a long way since the days of the hijra, and I’m willing to bet we’ve got a long way to go before we can take a deep draught of nepenthe and happily consign all those painfully acquired facts to the oubliette of history. 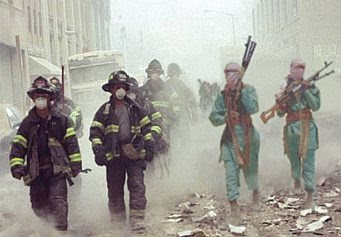 For a while after 9-11 it really seemed that the West might wake up to the threat posed by the Islamic invasion. But then George W. Bush invented the Religion of Peace and told us that the enemy was a bunch of “extremists”. If we invaded the right countries and delivered enough JDAMs to the right targets, the war would be won. Osama bin Laden is dead. So we’re finished, right? The threat from the “radicals” has passed, hasn’t it? With every country we invade or assist, we create new legions of Muslim refugees. Being generous by nature, we feel compelled to import them into the USA. First Somalia, then Afghanistan and Iraq. And, since the Arab Spring has now taken hold, we can expect Tunisians, Egyptians, and Libyans. Coming soon: Syrians! The result? The number of mosques in the United States has nearly doubled in the last eleven years. And New York City is #1 in mosque construction. Will the next set of twin towers in New York City be gigantic minarets? 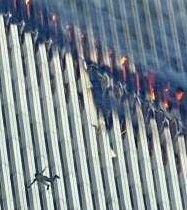 The average American seems not to realize that the office workers, the firemen, and the police officers weren’t the only figures that came staggering out of that choking dust cloud eleven years ago in Lower Manhattan. The mujahideen were walking right there beside them, and they’ve spread out across America and the rest of the Western world in the years since. Not all of them wear masks and carry AK-47s. Many of them wear business suits and have engineering degrees. Some speak well and get elected to public office. But it’s still jihad. And their goal — the world Caliphate — is well-attested in their own writings, if we would only take the trouble to have a look. 9-11 didn’t slow down the Great Jihad. If anything, it accelerated it, because so many well-meaning Americans were determined to prove how tolerant and inclusive they were. They felt compelled to allow more Muslims into the country, engage in more outreach, and share their worship spaces with their fellow “Abrahamic” believers. How many veiled women did you see on the streets of your town in 2000? And how many do you see today? So, as yet another bright and tenebral September 11th dawns, let’s consider how we might possibly turn the tide. This isn’t a matter of maintaining a strong military — although that is absolutely necessary — or blowing up terrorists in Waziristan. This is about stopping stealth Islamization right here at home. It means educating our fellow citizens, somehow, against all the odds, about what has been happening to them while they weren’t paying attention. About the world they will bequeath to their children and grandchildren thirty or forty years from now. Yes, it seems an impossible task. But so did Omaha Beach on D-Day. I doubt I’ll make it through the surf, but some of you youngsters will. Don’t lose your climbing gear — you’ll need it when you get to that cliff. Thank you, Baron, for the perspective and inspiration. Something else has changed very much in the last decade. You only mention it in passing, probably at least in part out of modesty. Ten years ago, I was not aware of the counterjihad movement. I don't know to what extent it even existed, but I am sure that it was much smaller and less organized than it is now. I am also sure that you and Dymphna have played a large role in nurturing it to its present size and organization. This brings me to your D-Day analogy. The counterjihad movement on 9/11 reminds me of the Allies' military forces near the beginning of WWII; and the counterjihad movement now seems to me to have made substantial progress toward becoming a force more like the Allies' military forces on D-Day. It'd be interesting to hear your perspective on this. For example, what was it like before the EDL and the other groups it has inspired had come to be? I'm sure there are many other questions I don't know enough to ask. If you feel like filling us in some more (within the limits of security considerations), it would be a blessing to read. May God bless you and Dymphna, may God bless the counterjihad movement, may God bless the non-Muslim world, and may God bless Muslims with the collapse of Islam, among other things. Great post Baron. I hope people wake up to what is happening. That's a good post Baron. Looking into the day to day lives of Westerners from the sidelines one may be forgiven for thinking that nothing has been learned in those eleven years concerning the adventures of Islam. But learning is a gradual process that takes time to impress. I am a great believer in God given common sense that most folk will follow when faced with simple truths. It's just that the truth has been forced to take a holiday lately while those who have thought to set our agenda and wish to control us still have their way, and that situation can't last forever, and as the lessons of 9/11 are taught and learned by more and more of us, the truth will be outed one day. "Point n’est besoin d’espérer pour entreprendre, ni de réussir pour persévérer." "It is not necessary to hope in order to undertake, nor to succeed in order to persevere." Anyone who doesn't realise the seriousness of the threat deserves everything they're going to get. No if it were up to ordinary Americans we wouldn't be importing more Muslims. This is a choice the political elites made via edict and at the point of a gun should we resist. Bush42 was a disaster as a president. Instead of enforcing immigration rules, we welcomed hundreds of thousands of Iraqis(who were immediately given SS, Medicare and everything they wanted), did not expel the hundreds of thousands of Muslims who overstayed on their visas, he refused to shut down that express Visa program with KSA that allows just any Saudi to come to the U.S. by just filling out a on-line app at the U.S. state dept, we kept the border open with Mexico, etc. Bush42 did everything to sell the American people than Islam was a religion of peace. How many confabs did he have with the Mullahs and Imans after 9/11, a dozen? All to show the American people Muslims are OK. It was under his administration we accelerated the recruiting and promoting Muslims in our military, like Hasan Nidal into our military. Sadly both parties are treating Muslims as a another special interest group to cater to. The American people don't have a say in anything. If we examine the situation in Scandinavia, which is far more advanced in terms of Islamic penetration, the people there seem not to resist at all elite efforts to transform those countries. Sweden, for example, is Islamizing at the rate of perhaps 1% per year. Those Swedes who can will eventually emigrate (to where I don't know). It's over. No one stopped it. No one will. Why should the US be any different. The process of Islamization will take far longer here, but it will happen. As long as our politicians say Islam is benign, as long as our teachers tell students of the wonders of Islam, as long as the ladies on The View assure us that there's nothing to fear, the American sheeple will do absolutely nothing to stop it. This is the beginning of the end of the age of freedom, of the Enlightenment, of science, of liberty and prosperity. It's over. One should use the cracks Islam is showing, pouring water in them, and wait until it freezes. The Enlightenment is over, but a new, powerful religion could change a lot. Always tell the truth, and combine it with warnings of eternal hell and damnation, so people won't close their ears. As far as I am aware so far no "American" muslims have been found swelling the ranks of the muslim brotherhood in Libya, Syria or elsewhere. This is not the case with "British" muslims, born and bred here, who seem quite easily to be able to train and arm themselves here and then travel to fight abroad, the same people who killed over 50 people in London on that July day. The British government just seems to accept it as the norm and doesn't seem unduly troubled by it. Nor do you have a Pakistani muslim woman effectively in charge of the remaining Christians here, those whom the Marxists haven't managed to brainwash. Still, I suppose she is only a minister and not a muslim president like the one you have got. As regards the Swedes who will jump ship, as I commented yesterday, now that New Zealand has started the islamification process there will soon be nowhere for Europeans to flee to apart from Poland and the former Czechoslovakia. Actually, Serbia is guaranteed to be muslim-free!! Egyptians Storm the American Embassy Walls. Consider this a prelude to disaster. The U.S. is finished in Egypt. We're sending them aid and they ain't taking our orders any more. The MB is in charge now. Barring the geographical references, and some unfortunate experiences in my family, that could have been me writing. Back in 2000 I wasn't paying much attention to the Religion of Peace. For some strange reason, in early 2001 I started to mention it in some discussions. And then, when the planes hit, I had a feeling it might be bin Laden - I had read about his Jihad against the US a couple of years earlier. Before that, I had watched The Delta Force with Chuck Norris, and had heard about Islamic terrorists. I thought they were the scum of the earth. But I could never have imagined having any suspicions about any of the Pakistani shopkeepers in my part of London. In fact I thought Pakistan played good cricket, and supported them when they played against India. A comment on JihadWatch (from years back) featuring an article from the Irish Times about a Latvian girl in Ireland meeting an "Orthodox Greek", who turned out to be a Sunni Lebanese - and a drug dealer (or similar). After he was released from jail, she was found dead. The Holy Land Foundation documents about the Muslim Brotherhood staging a "civilisation Jihad from within". A Youtube video of ex-BBC presenter Rageh Omaar doing a documentary about Mohammed - saying how he had "set out from these beaches to conquer the World". Comments from various Muslims on Islamic websites - calling for boycotts of shops, only because they were owned by Hindus. These facts, and more, for me alluded to the problem being not just some "radical offshoot" - but the religion itself. And posed the question - is the main form of the "civilisation Jihad" being fought with bombs and weapons? Or using other, less-conventional weapons, such as money, or even the human womb? @Anonymous: "there will soon be nowhere for Europeans to flee to apart from Poland and the former Czechoslovakia." As a resident of Poland, I can say that your image of it is sadly becoming out-of-date. Now you will find Kebab shops on almost every corner of the big cities - and a good deal of the smaller ones. A great deal of Chechen asylum seekers have arrived - often welcomed with open arms by Poles happy to see some "brothers fighting Russia". And Polish women are famous for their naivety in the face of Muslims making advances - a friend in London once told me 90% of Polish girls he knew were going out with Muslims. Still, after 1989, free speech is valued here. And the masses of Poles who made their way West after EU entry in 2004 often found themselves living in poor, "culturaly enriched" areas of their new cities. And came back with lots of interesting stories to tell. The result - that nearly all Poles who I know, from both Left and Right, are united by one thing: a strong opposition to the Religion of Peace... were a Geert Wilders to run for election here, he may even find himself winning. By a landslide. result HAS to be avoided. @Anon 11:58 am, note that Hitler, Stalin and Pol Pot started by confiscating arms. Do you really think that the largest militia in the world will give up its arms? I'm talking about American hunters, numbering in the millions. Baron, today is the Feast of the Holy Name of Mary, which was created in the 1500's and extended to the universal Church in 1784 due to Jan Sobieski's good work in the name of Heaven, carrying a banner of the Blessed Virgin Mary, which he later sent to Pope Innocent. This was not the first time the Blessed Virgin Mary was involved in repelling Muslims; winning the Battle of Lepanto, in which the Ottomans were repelled from Greece, thus preventing them from using the Mediterranean Sea freely in order to conquer Europe. I spent a year in Slovenia, before the breakup, and sang in a church choir in the district of Ljubljana called Bezigrad; literally, flee castle. The turks fled, leaving only their coffee behind.